A truly memorable gift, this handmade Lying Lamb is made entirely of luxurious cashmere and is dressed in a beautifully knitted sweater. 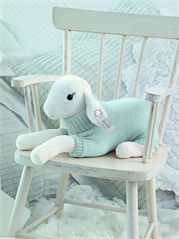 Perfectly sized for newborns and babies to cuddle and hold, the Lying Lamb also contains the trademark "button in the ear," Steiff's symbol of excellence and tradition. This most precious baby gift is not only soft, sweet and luxurious - it's also packaged perfectly. It's truly a stand-out gift.